Last year I came across the book, A Sane Woman's Guide to Raising a Large Family by Mary Ostyn of Owlhaven and found myself devouring it, nodding in agreement to what I read and making mental notes of things I didn't want to forget. Then I noticed Mary had written another book, this time on frugally priced family meals titled Family Feasts for $75 a Week, a book filled with grocery wisdom and delicious recipes. Both books are excellent! Today you'll get the chance to win one of Mary's books so keep reading for the details after the interview. Here is Cultivating Home's interview with Mary Ostyn of Owlhaven. Hope you enjoy it! For our readers who are not familiar with you, Mary, could you tell us a bit about yourself? I married my high school sweetheart 23 years ago. People thought we were nuts to marry at 19, but it was the best decision for us! We have ten kids, 6 of whom are adopted. Our oldest is a 22 year old newlywed. Our youngest daughter is five. I worked as a registered nurse at a birthing center for ten years, but became an at-home mom when our 5th child came home. I’ve been writing since 1996, blogging at since 2006. I’ve written two books, which both came out in 2009. 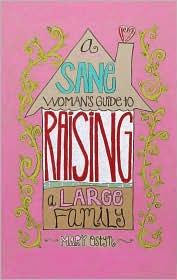 You wrote the book, A Sane Woman's Guide to Raising a Large Family. Did you always desire or plan on having a large family? Absolutely not. I am the oldest of 8 kids and when I was a teenager, I swore I’d never have more than 4 kids. My husband thought 3 would be about right. God must have been smiling. He worked on our hearts in a gradual way, and blessed us beyond our dreams. We would’ve missed so much joy if we’d said no to God’s leading and stopped at four children. I’m not saying our life is easy— frankly, there are moments when the task feels bigger than our ability. But that’s what keeps us leaning on God. And our kids are so worth the work! In your book, A Sane Woman's Guide to Raising a Large Family, you mention that several of your children are adopted. What first opened your hearts to adoption? When our 4th child was three, I felt a longing for another child. At the same time, my eyes were opened to the kids in the world waiting for families. There are so many kids who literally will never have a family, and I can’t think of a sadder thing for a child! My husband had reservations about adoption at first. For awhile I thought adoption would not happen for us. But God did a work in my husband’s heart, and now here we are with 6 adopted children. God’s grace boggles my mind! What encouragement or advice would you give to a couple, perhaps ones with older children who are looking forward to an empty house in a few years, to encourage them to look into adoption? Pray about it, come to agreement about it, and then trust God’s leading. I know that some people fear their heart-feeling toward their adopted kids won’t be the same as towards kids born to them. And when you adopt older kids, it can take awhile to feel like family—there’s just so much to learn about each other. But especially with little kids, it doesn’t take long at all before your heart knows they’re yours, plain and simple. For me, it happened within days of holding them in my arms. And each child is such a gift. I thought your book, Family Feasts for $75 a Week was fabulous and well balanced, but tell me, with your family size, how much do you typically spend a week on groceries? We spend around $200 a week to feed 10 people on a daily basis, along with weekend guests. Each weekend our oldest daughter and husband, and our second daughter and her boyfriend hang out and eat with us for a meal or two or three. So it’s not uncommon to have 12-14 people at dinner on weekends. If I am frustrated with the amount of money I am spending on groceries, what is one change I could quickly implement that would make a noticeable difference in my wallet? Simply put: shop less often. Plan meals 2 weeks at a time, and do a ‘big’ shop only twice a month. Make in-between trips brief, essential, and sales-driven. Whenever possible, be creative and do with what you have instead of going to the store for one or two items. Fewer trips to the store mean less impulse buying, and that always translates to more money in your pocket. Mary, you also homeschool your kids. Does your homeschooling fit into a certain category (classical, relaxed, unschooling). Also, can you tell us what grades you are currently homeschooling? I’m definitely a relaxed homeschooler. This year I have a senior, a sophomore, four kids in the 6th/7th grade range, a 2nd grader, and a kindergartner. I’ve homeschooled long enough to know that my laid-back approach gets good results—my older kids have been successful in college. But that doesn’t mean I don’t try new things. I just bought a new math program for my ‘middle’ kids that I’m really excited about. It’s called Teaching Textbooks. The kids are taught and do their work on the computer, and the computer automatically grades their work, which thrills me. For awhile there I was sinking under the load of stepping 4 kids through fractions and decimals at once, so I’m really glad to be doing something different. Can we expect another book from you in the future, perhaps on adoption or homeschooling? Or is there another topic you'd like to write about? I’ve thought about sharing our adoption story in more detail, so I might write about that at some point. But cooking is my current passion. I’ve gathered together a bunch of recipes, and would love to write another cookbook, maybe one with pictures this time. But we’ll see! Many thanks to Mary for granting me this fun interview! Mary is being very generous and offering a copy of each of her books, Family Feasts for $75 a Week and A Sane Woman's Guide to Raising a Large Family for a giveaway! All you have to do to enter the drawing is leave a note in the comments, making sure there it has your contact information. Share the giveaway on Facebook, Twitter, or your blog and leave a comment letting me know you did. You'll be entered again for each time you share! Comments will close on Friday. I have both of these books in my shopping cart at Amazon as I write this! I'd LOVE to win. Thanks, and congrats on having the opportunity to do the interview. Nice work! Neat interview! We don't have a large family...yet, but it's something that I think about frequently. I've been reading Mary's blog for years! Thanks for the interview - I'm sure many more will be heading over to her blog and be blessed by all she has to share! I'm voting for an adoption-themed book from her next! And I really like the sounds of the the $75 weekly food budget. I hope she writes about her adoption experience as well that sounds like a nice read. I would love to win The Sane Guide... I have Family Feasts and it is great. The books look great. As a mom to five lovely's, it is always great to read encouraging material. Wow. Great interview. I bet it was great fun. I would love either book although the Sane Women's Guide has been on my wish list for a long time!!!! I bought both of these books a couple of months ago! But I want to enter, as I gave one book away after I read, and I'd love to have a copy for myself! I linked this on my facebook page! Great post, would love a chance. She reminds me of Mary Ann Kuharski who has 14 kids or so, about 1/2 adopted, and some other families who have grown large despite society's turning against large families. I have 4 and have admired these women who can keep it together. I would love to have either book. I would love to have a large family. Great interview questions! I loved reading Mary's responses! I would love to have these books ! they look great.. But I do not have a blog or twitter.. so here is my email shboice@gmail.com. I am so thrilled to read the interview and enter to win a copy of one of Mary's books! When you mentioned her books a month or so ago, I immediately checked out her blog and her $75 Feasts book from the library. I am a huge fan of both- and would LOVE to read her other book! oh! count me in! i've been really interested in reading "a sane woman's guide..." since you first mentioned it. and the grocery one would be awfully timely for us! Shared about the give-away on my blog (with links to yours!) for a second entry! Just posted on my facebook page for another entry--Yippee! I borrow the meal one from the library and found lots of great tips...but would love to own a copy of either! Thanks! i would love to enter the contest! i have shared this on my facebook page. Lovely interview... and a wonderful giveaway! Thank you Hannah, As a mother of eight, both these books sound wonderful! I will only be able to enter once as I don't do facebook or twitter :o)...God Bless you. Thank you so much for this, Hannah! thank you for the interview and the chance to win! this would be so awesome! What a great interview... so much wisdom. Thanks for having the giveaway! I would love to own those books - great giveaway! I agree with the tip about staying out of the stores to save money- I'd love to hear what else Mary shares in her books! Her books sound great! Thanks for sharing this. Does four kids make us a large family? Both of these books sound great! Thanks for the giveaway. Linked to it on my FB page. I would love either book. I have enjoyed your blog so much. As a homeschooling mom of six, I can relate so well to what you write. oooh, fun interview! Both books sound interesting, but who wouldn't love to trim the grocery bill?! I always enjoy reading your blog. I wanted a larger family but that didn't happen. Glen and I still have our hearts open to more - either through adoption or fostering -- even as we are empty nesters now. Who knows? how exiciting. i would love to win. I would love to win either book. I have seen the cookbook before. Thanks! Thank you for showing off these great books, im always on the lookout for books just like these to keep me going and inspire me. Thanks again! Please enter me Hannah! I have never read either book and would love to! Hannah, I also posted on my blog. Thnaks for doing the drawing! I thought the interview was very interesting. I so enjoy reading your blog! Either book would be a blessing in our house! Please enter me! I'd love the groceries book! Thanks for having a giveaway! Very fun. Hope to win!! I have read Mary's blog for quite awhile now and would love to win either of these books (or both!). Oh, I've been wanting these books! Thanks for the giveaway! I'd love to win! I just started reading her blog recently and I love that she has such a positive message without sounding crazy. I had the privilege of testing some of Mary's recipes and giving her feedback. They were excellent! I can't believe I don't have a copy yet. I have these books on my wishlist. I would love to win them! I would love to win this book. I read A Sane Woman's Guide to a Large Family and enjoyed it very much. I would love to have this one as well. I've been wanting a copy of her cookbook! Thanks for the giveaway! Thanks! I've read Family Feasts and use it as a great resource. I would love to enter the giveaway. I have looked at the cookbook and it is awesome. Lots of good recipes to try. I am currently borrowing Family Feasts from the library and will be sad to send it back. I would love to have my own copy that I could makes notes in. It is a wonderful book. Great interview, looking forward to Mary's next book. Great giveaway! She is so fantastic... and the books look amazing.. Please enter me! I have checked out the Sane Woman's Guide from the library and browsed the cookbook at the bookstore, but I would love to have my own copy of either! Oh, I'd love to have a copy of Mary's book! I'd love to have her book. I used to "know" Mary via email when we were adopting at the same time a few years ago. Oh please enter me! I would love to have a copy of either book! Thanks for the opportunity-it would help our family I think. I enjoy Mary's blog and would love one of her books...both actually. Praying for God to open her husband's heart to adoption--how perfect! I Facebooked this offer. Facebooked: the new verb. Please enter me for Family Feasts, I have been watching Costco so that I can get one for my sister and they are out. Puting up a post on Facebook. What an exciting giveaway! And Thank you to Christy for posting this on her blog. I had never heard of this author before but am now sooo interested in her books. This book looks amazing! Thanks for the chance to win. I LOVE Mary's blog - I use her bread recipe all the time. I have some dough rising on my counter right now! Would love to win her book. Thank you. 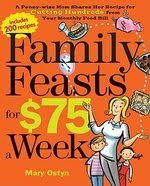 I just borrowed the $75 Family Feasts book from the libarary, and I loved it! I would love to win either of Mary Ostyn's books. Thanks for the giveaway! I love this book. I want my own copy. What a nice interview -- and both of these books sound lovely! Oh I would love to win this book! I know I could learn so much from her! It is so exciting to hear that it is possible to have a large family and still eat well. I am pregnant for the first time and am hoping to have a large family. Thanks for the interview. Loved the interview, and I would love to have her books! We have 4 kids, aged 4,2,1, and 1 month. We are planning on at least two more. Praise God for women who have already been through this and have advice for others! I've retweeted,and posted it on facebook and my blog!! The $75 budget book would certainly come in handy at my house! We're working hard to stretch every penny and save a quarter of our income this year, and all the tips I can find will help with that goal! I really want both of these books! I have been looking at them on Amazon for several months now. Thanks for having this giveaway! I'd love a copy of either book! I would love to read her books! If I win or not! How wonderful! Thanks for the chance to win one!! I've been reading Mary's blog for years and I would love to read her books! Thanks for the giveaway. Hannah, I'd never heard of Mary Ostyn before, the interview was great. I would love to entered to win her books. I've heard of the books before, but have not had a chance to read them yet. I would love to entered to win her books. I would love to read those books! I have 7 children and could always learn more to help me become a better mom and homemaker.